I am super excited about this amazing find!!! Thanks to The Organized Classroom Blog for sharing this! 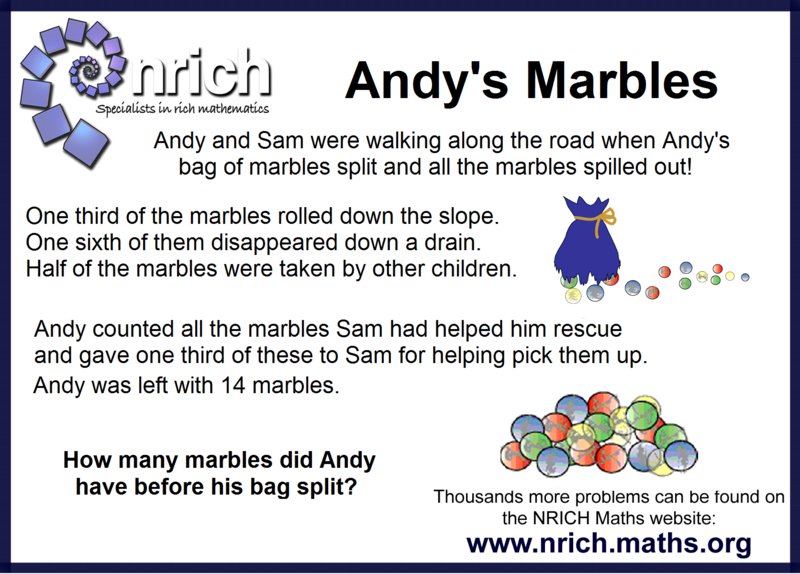 NRICH: Specialists in Rich Mathematics offers a downloadable set of 70 math 'posters', like the one I've shown here, Andy's Marbles, which cover a huge array of content. They can be printed off as a .pdf file or displayed on a ActivBoard as a .png file. I love the idea of having these high-quality, ready-made images that I could use as a warm-up, during a lesson, or as a closing in my classroom...DISPLAYED RIGHT ON MY ACTIVBOARD! The posters are divided into 4 different grade bands, but looking through them, I can easily see being able to use some in grade levels other than what is listed. To make this find even better, there are Problem Pages to go along with each poster. These could be used a a student handout as they are also printable, or just displayed on your board as you discuss the solution. There are also Teacher's Notes, Hints, and Solutions available! Get yours now at NRICH! You can also find them on Facebook at nrichmaths.